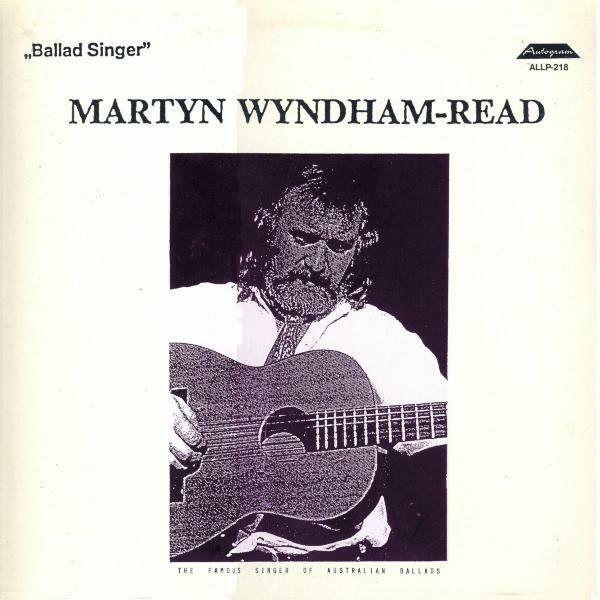 Martyn Wyndham-Read (born 23rd August 1942 in Sussex) is an English folk singer, notable as a collector and singer of Australian folk songs. He lived and worked in Australia from 1960 to 1967 and has been a regular visitor to the country since then. We've previously published work by this fine English folk singer who once made his home in Australia and has also been a constant visitor to our shores. He is still a regular performer. His interest in Australian bush and folk music continues. This album is a 1978 German publication which provides music and lyrics for many of the tracks. The extensive notes on the rear and the LP insert are in both English and German. A kind person, George, provided this album to my friend Gonzo who has lovingly ripped and cleaned the music and then gave the result to me for publication on this blog. Many thanks George and Gonzo. it consists of Australian Bush songs, generally about sheep shearing and associated pastimes. Because it is so Australia specific I have asked my friend that runs the Australian folk music blog if he would like to post it. I ask you to visit occasionally his excellent BLOG and keep an eye out for. specially the vital history of Martyn and a dear personal friend of his, Brian Mooney, whom I have met and supped a Guinness with at the Georgetown festival in Tasmania. I appealed to any German blog visitor that could help with the translation of the German text, I had a reply from Reinhard Zierke. This will be published here in text format, it will also be available on Paul's blog as an additional download file. 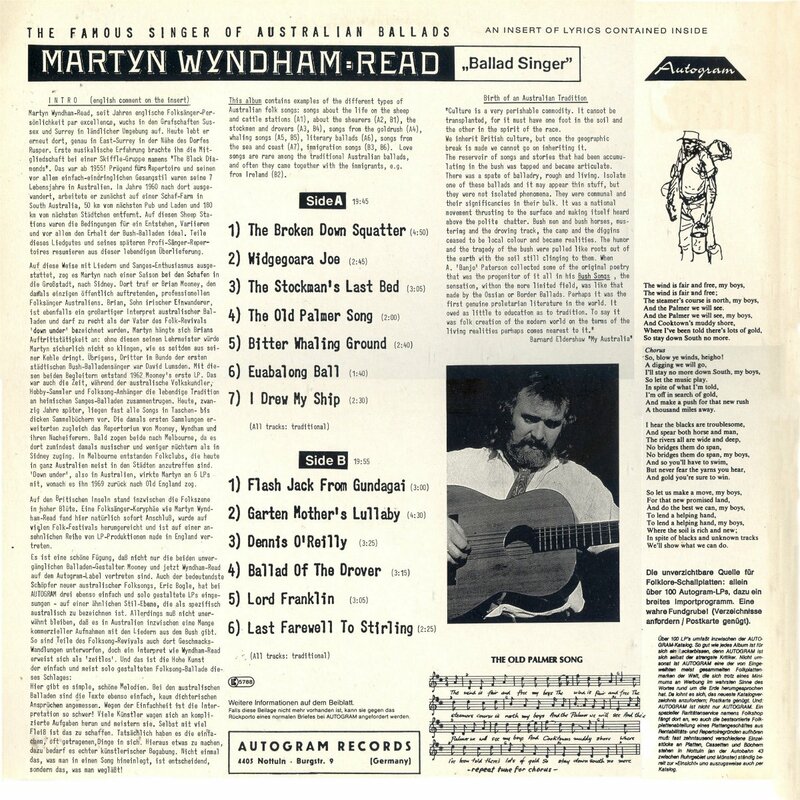 Martyn Wyndham-Read folk singer, his influences and development in Australia and later in Great Britain. he lives there again, in East Surrey near the village of Rusper. His first musical experiences were in a skiffle group called "The Black Diamonds" back in 1955. His repertoire and especially his simple but vivid style of singing were formed by seven years spent in Australia. He emigrated in 1960 and worked at first on a sheep station in South Australia, 50 km away from the next pub and store, and 180 km away from the next town. These sheep stations were ideal for creation, variation and keeping of bush ballads. Parts of this genre and his future professional repertoire stem from this living tradition. Equipped with songs and song-enthuiasm, after a season with sheep Martyn was drawn to a city, Sydney. There he met Brian Mooney, then the only professional folk singer in Australia appearing in public. Brian, son of Irish immigrants, is an equally great interpret of Australian ballads and may well be called the father of the folk revival 'down under'. Martyn attached himself of Brian's gigs; without this teacher he surely wouldn't sound as he now does. By the way, the third one in this group of urban bush-ballad singers was David Lumsden. With these two companions Mooney cut his first LP in 1962. This also was the time when Australian folklorists, hobby collectors and folksong fans compiled the living tradition of local ballads. Today, twenty years later, nearly all songs are available in pocket books or thick anthologies. The - then - first anthologies expanded the repertoire of Mooney, Wyndham-Read and their followers. Soon both moved to Melbourne which was more musical and less prosaic than Sydney. In Melbourne evolved folk clubs that nowadays can be found all over Australia's cities. Martyn collaborated on six LPs in Australia before he moved back to England in 1969. In the UK at that time the folk revival was in full bloom. Of course, a folk singer of Martyn Wyndham-Read's standing found immediate connections, was invited to many folk festivals, and can be found on a respectable amount of LPs made in England. It is a fine coincidence that not only the two immortal balladeers Mooney and now Wyndham-Read are represented on the Autogram label. In the same way, the most important creator of new Australian folk songs, Eric Bogle* (http://www.ericbogle.net/), has cut three simple solo LPs for Autogram, in a similar, typically Australian style. However, it must be said that in the meantime in Australia there are a lot of commercial recordings of bush songs. Parts of the folk song revival are subject to changes in musical taste but an interpret like Wyndham-Read proves to be 'timeless'. This is the fine art of the simple and usually solo folk ballad: There are simple but beautiful melodies. Australian ballad have lyrics just as simple, hardly worthy of poetic claim. But because of this simplicity their interpretation is so difficult! Many artists try and cope with hard tasks - this can be done with just a lot of effort. But to excel with simple songs needs real artistic talent. It isn't important what to put into a song, it is crucial what to omit. / Notes: * Eric Bogle AM (born 23 September 1944, Peebles, Scotland) is a folk singer-songwriter. He emigrated to Australia in 1969 and currently resides near Adelaide, South Australia.